I was really excited to post this tutorial for you guys! I have tried to put salt, paper and so many other things on my nails. This time, I used FLOWERS, yes, real flowers!! My mom was the one who came up with this idea. In our house, she has a small corner which she likes to call as her garden. She has some plants and a couple of pretty flowers. She always sees me do my nails and she is always my first audience/critic when I do my nails. 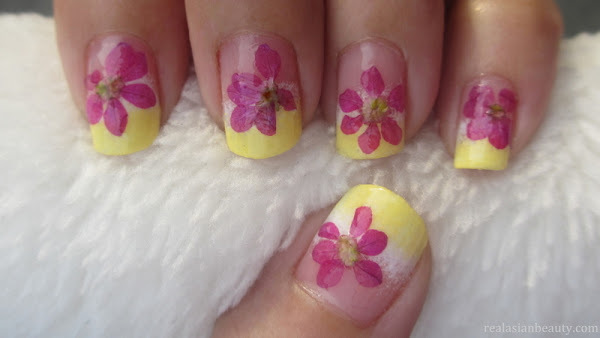 One day, she told me it would me nice to have real flowers on nails! She taught about it over a month ago but since it's been raining for more than 2 weeks in the Philippines now, I couldn't do it because the flowers were all messed up. The weather was so perfect yesterday so I taught of finally doing it. I tried it and it came out awesome! I really like it! I really adore this design. Thanks to my mom for the wonderful idea. You may not like this because of how it looks in the photo and in the video, but trust me it's a lot better in person. I don't know why most of my works are ugly in the photo but really pretty in person.. Anyway, I really suggest you try this now! It's perfect for the summer season. Hurry while flowers are still blooming! Before you know it, it'll be Autumn and the flowers would be gone. I hope you like this! Each time I create a nail art, I am always my own critic. I always try to come up with a unique and pretty design for you guys. I will try to come up with better ones in the future. Watch more videos on our YouTube channel. Also, if you have a blog or Google friend connect account, then please don't forget to follow this blog.